It’s apple butter season! Ok, well, it’s apple season, and just like every year I find myself craving apple butter, apple pie, apple dumplings, apples in salads, apple cakes, apple cider, I could go on for a while. I like Empires, Honeycrisp, Cortland, and Fuji for eating out of hand, and usually bake with Granny Smith or Gala. I’ve tried a number of different apples for apple butter, and finally settled on Gala as my favorite due to it’s slight sweetness and soft texture, which easily cooks down. 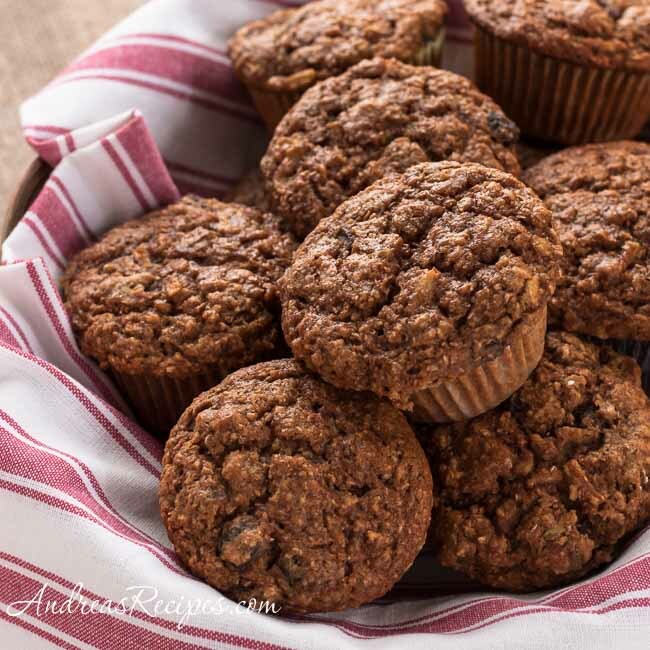 I found this recipe for muffins at Eating Well and as soon as I saw they had apple butter in the ingredients this recipe went on my to do list. I first made them for a girls’ brunch, where they were a hit, and have also sent them to school for teacher breakfasts. My family loves them and I always make a double batch so we can have some for another day, and they keep pretty well because they are so moist. I make the muffins according to the recipe with only one change, I grate the apple rather than chop it because I like the texture better that way, but you can certainly chop if you prefer. Applesauce has long been used as an ingredient in muffins, and apple butter makes so much sense because it adds flavor as well as moisture. You can use just about any kind of apple butter you like, but I recommend choosing one with plenty of spices. 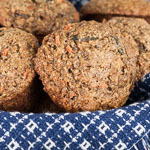 I also love the molasses in the muffins, which gives them a rich flavor. Preheat oven to 375°F/190° C. Put the raisins in the small bowl and cover with hot water. Set aside for about 15 minutes. In the large mixing bowl, whisk the whole-wheat flour, all-purpose flour, bran, baking powder, salt and cinnamon. In the medium bowl, whisk the egg, milk, apple butter, brown sugar, oil, and molasses until blended. Make a well in the dry ingredients and pour in the wet ingredients. Drain the raisins and add them and the grated apple to the bowl. Stir just until combined, but don’t over mix. Divide the batter evenly in the prepared muffin pan. Each cup will be full. Bake the muffins in the preheated oven until the tops spring back when touched lightly, about 18 to 22 minutes. Let cool in the pan for 5 minutes, then loosen the edges and turn the muffins out onto a wire rack to cool slightly before serving. 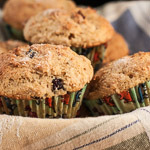 I find that whole grain muffins tend to stick to the tin and the papers, so I lightly spritz the muffin papers with cooking spray, and they release more easily. 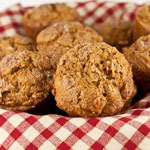 These apple muffins sound so delish and healthy too! I love making apple butter but I’m always at a loss for ideas for how to use it (other than eating with a spoon right from the jar, of course!). Thanks for this muffin recipe. They’re going on my to-do list for this weekend. Sounds delicious. I love muffins and Yours looks so great. Beautiful post!! And, to think, I just put up a bunch of fresh apple butter! Did I subconsciously know you were going to share this great recipe? Don’t know. But, have definitely put it in my file. Thanks for sharing. Come visit when you can. These muffins look soo good. I always get so excited when apple season comes rolling around. Yum! yum!! i love anything with apple butter in it. these? To Be Made! thanks! Thanks for posting! Sounds delicious.